As we came over the last of the Seven Sisters, Haven Brow, Cuckmere Haven opened up before us. 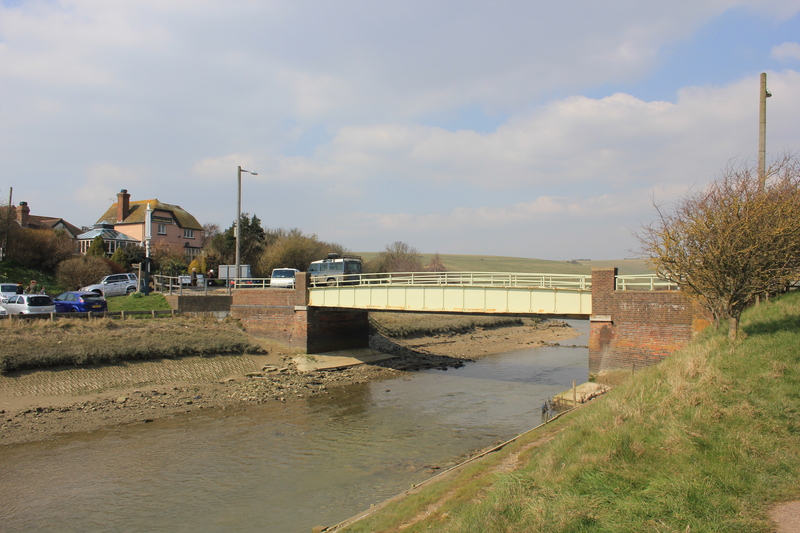 It looked on the map as though we would have to walk a mile or so inland in order to cross the Cuckmere River. I followed the river upstream and could just about see the white bridge in the distance. As I looked back down to the river mouth, however, it seemed to me as if it might be possible to walk straight across. It was low tide and the water seemed to be just a trickle. Could we avoid the inland walk? 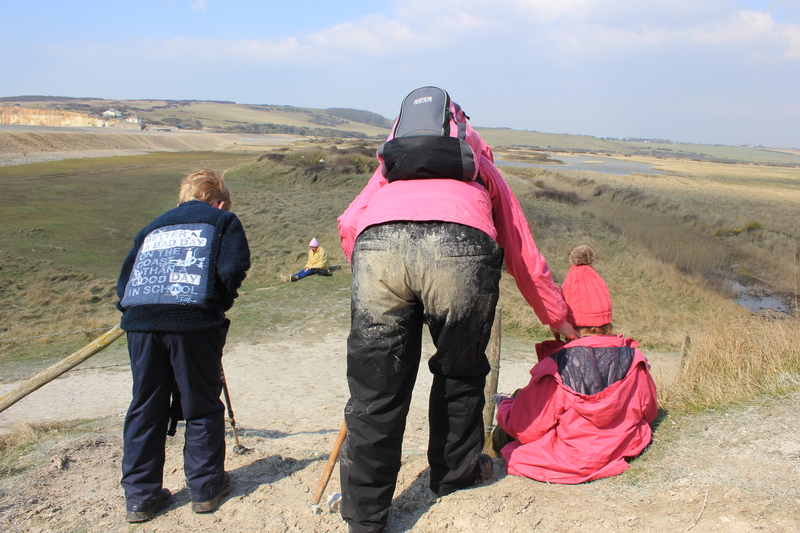 We first had to navigate our way down into Cuckmere Haven itself. The good news was that there was a path. The bad news, for one of our party anyway, was that it was steep. My wife is not a fan of steep. She decided the best thing to do was shuffle down on her bottom. As she shuffled, I documented her descent with my camera. At first she took it all in good humour. But soon there was no more smiling for the camera. My poor, poor wife. Her waterproof trousers were in a terrible state when she got down. She had to take them off (I hasten to add she was wearing some other trousers underneath). Cuckmere Haven itself is both beautiful and important. It was well known as a smugglers’ beach during the 18th Century. Later, during World War Two, it was surveyed by the Luftwaffe who considered it to be a potential landing site for an invasion of England. 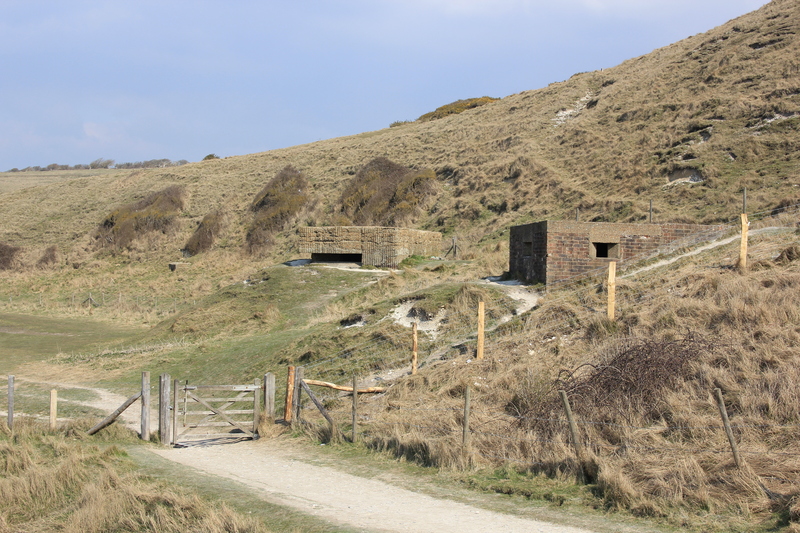 As a result, the British built pill boxes, dragon’s teeth and other defences, many of which can still be seen today. 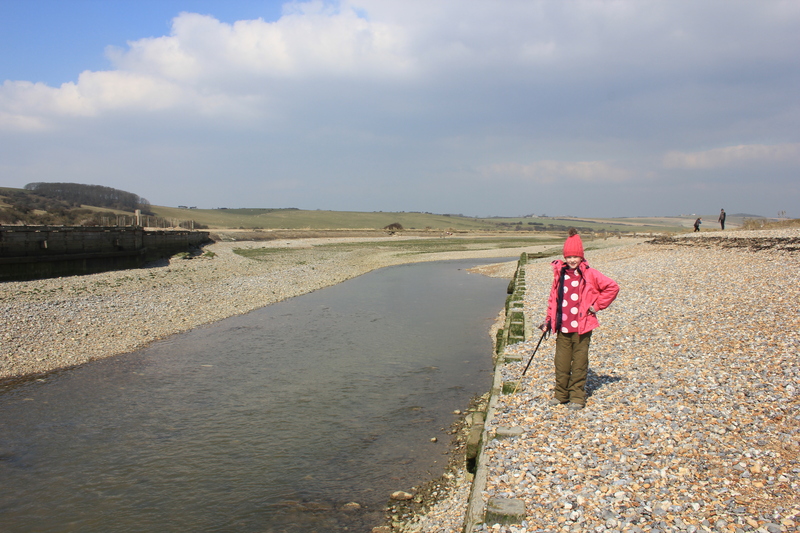 We walked over to the mouth of Cuckmere River, becoming more and more convinced that we were not going to be able to cross it. Indeed, when we arrived we found it to be too deep. There was no option but to walk a mile inland, cross at Exceat Bridge, and then walk a mile back out again, down the opposite bank. I was surprised at how much pedestrian traffic there was as we walked up to the bridge. 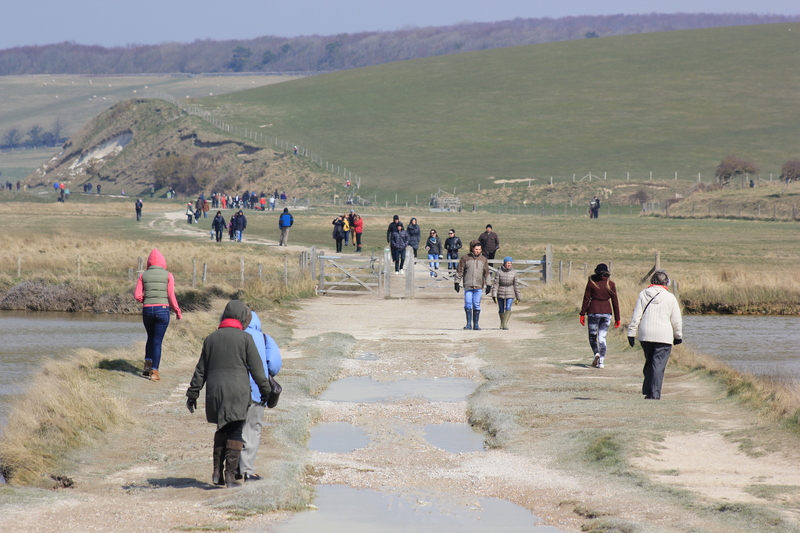 People seemed very happy to walk down to the shingle beach, but clearly did not want to venture up onto the Seven Sisters where we had seen virtually nobody. Was it really that much effort to walk up to such a beautiful place? It reminded me of the situation at Beachy Head, where the cliffside road and the abundance of car parks seemed to entice people to flock there. Yet the Seven Sisters, a more beautiful section of coastline in my view, seemed virtually abandoned, all due to the access being less convenient. The walk up to Exceat Bridge was a trudge. But eventually we got there, crossed, and then turned around to walk straight back out to the coast again. This entry was posted in East Sussex and tagged coast, cuckmere haven, cuckmere river, East Sussex, seven sisters, travel, walking. Bookmark the permalink. Great blog post. I remember this walk very well. 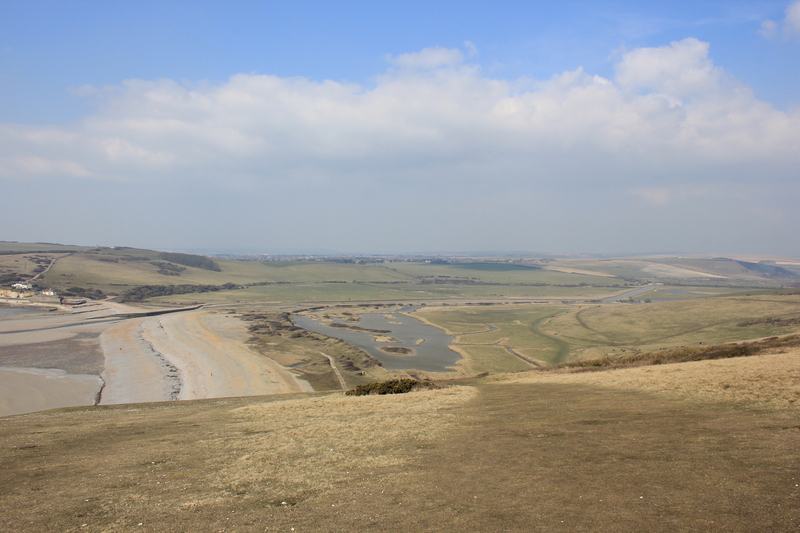 Loved Cuckmere Haven – which took me by surprise as I wasn’t expecting it. Like you, I wanted to ford the river but I realised it was too deep. 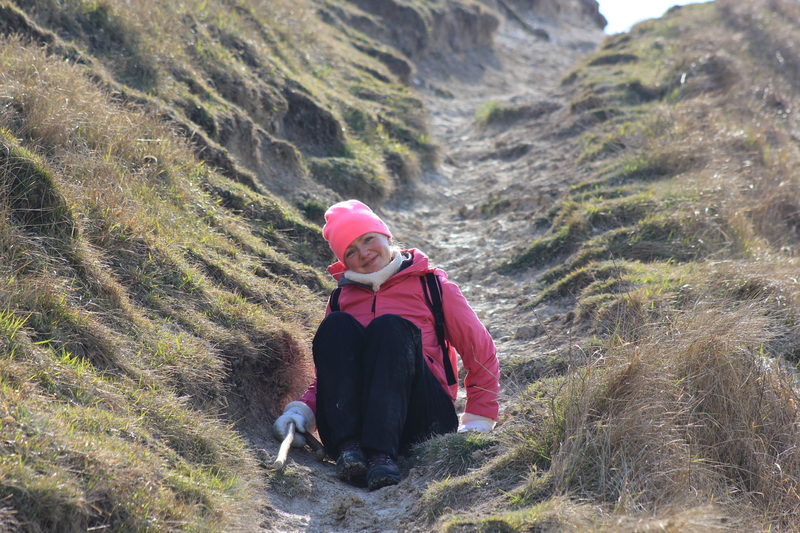 Unlike you (and your brave wife) I didn’t try and come down that very steep path!